Pick-up & Transportation: Pick-up is either at the Airport, bus or PNR terminal. On board a van or bus from Naga to Nato Port, Sangay (for RORO sea transport leaving at 6:00am daily). Naga to Sabang, San Jose (for pumboat sea transport leaving at 6:00am/8:00am/10am/1:00pm). All sea transport dock at Guijalo Port, Caramoan. From the port is 10-minute ride by land to the centro Caramoan. Pack rate include: (a) Breakfast, Lunch, Dinner (B/L/D) Snacks (local & native kakanin)buffet/fiesta or set plate servings. (b) Land and sea transport for island hopping and visit to Mt. Caglago where the statue of our Lady of Peace stands on top. Uphill is 527 steps.. (c) Pick-up from and to Guijalo Port. (d) Tour guide. Accommodation: Aircondition rooms of ISTARAN HOTEL, with individual toilet & bath, bidet,hot& cold shower. Installed with flat TV and cable connections, intercom,side and coffee table, wall mounted fire exit diagram and advisories. Istaran Hotel Amenities: With coffee shop, aircondition function hall, wi-fi ready, brown-out free, insurance coverage and DOT accredited. 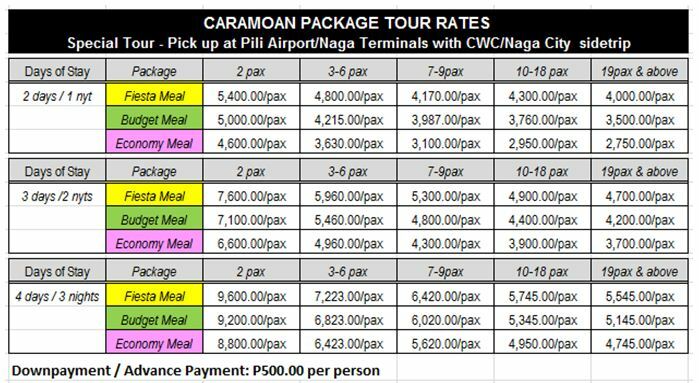 For CWC and or Naga Side Trip: a rented van or AUV will service the guest to CWC and/or Naga City for a sight-seeing and tour. No food included in the package during the side trip.